Posted on October 28th, 2013. In recent days folks have asked how the name “African Moons” came about. The name “African Moons”, was chosen because of an experience Helen Bruton, my mother, had the first year our family lived in Africa. Throughout her life she experienced divine intersections when she prayed in the dark hours of the night and watched the moon. Maybe, as you read this account of her surrender to the will of God, you also will hear that “still small voice”. Alone, she looked out her bedroom window into the dark night of Africa. The intense heat of the sub-Sahara sun had eased and the quiet peace of the night hovered around our mud house. The mesmerizing sound of the old owl hooting from the palm tree outside our front door comforted me as I lay in bed. The mosquito net was tucked tightly underneath my mattress to keep me safe from unwanted critters. I yawned and drifted into my world of dreams. But, this peaceful scene defied the anguish and turmoil raging in Mother’s heart. Contemplating her destiny, she stood wondering if she would survive living in primitive Africa for three years. Isolation from her happy life in California caused conflict and heartache. The loneliness was unbearable. 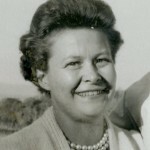 Helen Grant Bruton grew up in a small farming town in Minnesota. Shortly before graduating from high school, she stood at the window of her childhood home. The snow glistened in the moonlight on that cold winter Minnesota night. “God, what plans do you have for my future?” “I choose to follow your plans for my life”, she prayed. “Show me what to do and I’ll go where you tell me to go.” she said. That night she made a consecrated decision that would lead her through a life journey of unexpected adventure and numerous crossroads that would test her promise to God. Sixteen years later, mother stood looking at the same moon, seven thousand miles from her home town in Minnesota. This time the questions were different. A recent suburban housewifewith the comforts and conveniences of modern America, she now faced the clashing reality of living in primitive Africa separated from family and friends. Slowly, the full moon surfaced over the horizon. The dark night became alive with distinctive images from the veiled shadows below her bedroom window. This adventure wasn’t happening to someone else. So many questions: How was this new life going to affect Paul Jr., her first-born fifteen-year-old son, and Sally, her five year old daughter? And then, she thought of the new life she was carrying that would be born in a few months. The adventure of crossing the Atlantic on a Post WWII Liberty ship delivering cargo to ports-of-call in South America and the West Coast of Africa, had already taken her family 70 miles up the Amazon and 80 miles up the Congo River. Nine weeks after leaving New Orleans, the Del Campo finally docked at the Port of Lagos, Nigeria, her family’s final destination. Mother agreed to risk everything she had to honor God and allow Him to take first place in her life. This was not an adventure in a book. This was now her life. How was she going to adjust to life in this strange and difficult land? Looking back that African night, as unique as mother seemed and exceptional as her personal sacrifice appeared, she found herself feeling the overwhelming emotions that any woman would feel in her place. Far from the life she had always known, bringing her children into this new world, facing unseen dangers and remarkable moments, the only thing she could see as she looked into that night sky was the full moon and starlight. An agonizing loneliness gripped her heart. Indescribable emotions swirled through her thoughts as she desperately looked for answers. The more she thought, the more despondent she felt. What change was supposed to occur to transform her and give her peace to adapt to the new life that was before her? That evening this chapter of her surrendered life to God and to the people of Africa began. When all was said and done, she devoted over thirty years to that African sky.